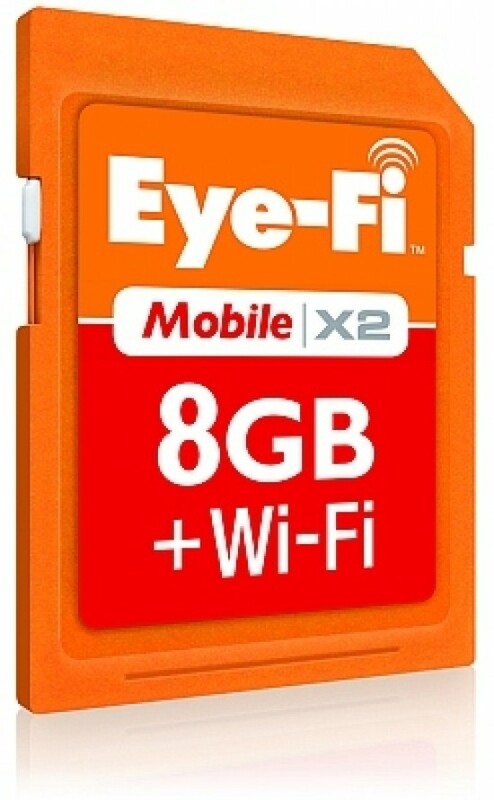 The Eye-Fi Mobile X2 is an 8GB SDHC memory card that provides instant uploads anywhere by wirelessly connecting the camera to a mobile device, such as a smartphone or tablet. The card will be available for pre-orders immediately on Amazon.com, and available at Apple and Best Buy stores across the U.S.A. for $79.99 on 17th April. Owners of other Eye-Fi X2 cards will benefit from Eye-Fi’s Direct Mode, scheduled for release later this week, which empowers the cards to establish a direct connection to a mobile device by creating their own Wi-Fi network anywhere. The launch of Direct Mode will be accompanied by new Android and iOS apps that enable smartphones and tablets to receive files sent from an Eye-Fi X2 memory card. Direct Mode and the accompanying apps are offered as free upgrades to every Eye-Fi X2 card. MOUNTAIN VIEW, Calif., April 12, 2011 — Eye-Fi Inc. (www.eye.fi), makers of the world’s first wireless memory card, today launched the Eye-Fi Mobile X2, a new 8GB wireless memory card empowering cameras around the world with immediate uploading capabilities. The Eye-Fi Mobile X2 provides instant uploads anywhere by wirelessly connecting the camera to a mobile device, such as a smartphone or tablet, and is available later this week for $79.99. Later this week, Eye-Fi will be releasing its Direct Mode and accompanying iOS and Android apps as free upgrades to its line of Eye-Fi X2 cards. With Direct Mode, users can enjoy the best of the devices they already own, namely the quality of digital cameras and the ubiquitous connectivity of their mobile devices. The Eye-Fi card can now establish a direct connection to the mobile device by creating its own Wi-Fi network anywhere users capture memories, even if that is miles from a Wi-Fi hotspot. Whether they are hiking or at the beach, consumers can now send photos and videos directly from their digital camera to the Eye-Fi app on their smartphone or tablet, enabling them to back up, edit and share their memories in the moment. “When we undertook a redesign of the Eye-Fi card line a little over two years ago, the new X2 card platform promised users the potential for new, exciting capabilities over time. Today we see another one of these revolutionary capabilities come to life: Direct Mode,” says Yuval Koren, co-founder and chief product officer of Eye-Fi. Direct Mode benefits extend beyond device-to-device transfers. Whether users want to edit their memories using the myriad of apps on their mobile devices, back them up those memories on their home computer, or save them in a private Eye-Fi account, they now have the flexibility and control of where, how and when the media is stored, edited and shared. Eye-Fi Mobile X2 will be available for pre-orders immediately on Amazon.com, and available at Apple and Best Buy stores nationwide for $79.99 on April 17, 2011. Direct Mode will be available as a free upgrade to all Eye-Fi X2 cards later this week, along with accompanying free mobile apps for iPhone, iPad and Android devices. The Eye-Fi Pro X2 will be reduced from $149.99 to $99.99 starting this month. Founded in 2005, Eye-Fi is dedicated to building products and services that help consumers manage, nurture and share their visual memories. Eye-Fi’s patented and patent-pending technology wirelessly and automatically uploads photos and videos from digital imaging devices, including digital cameras and the iPhone, to online, in-home and retail destinations. Headquartered in Mountain View, Calif., the company’s investors include LMS Capital, Opus Capital, Shasta Ventures and TransLink Capital. More information is available at www.eye.fi. Eye-Fi memory cards work like a regular SDHC memory card and are compatible with most compact and DSLR cameras. Users can also select which photos and videos are uploaded, and where they’re shared – choosing from 45 partner sites, including Flickr, Facebook, Picasa and more. Never run out of space with Endless Memory. Eye-Fi products and services are now available at Wal-Mart, Best Buy, Target, Office Depot and Apple stores nationwide and online. For more information about Eye-Fi, please visit www.eye.fi.